Want to be notified of new releases in herbrandson/k8dash? Eric Herbrandson Small fix to colSpan on workloads. 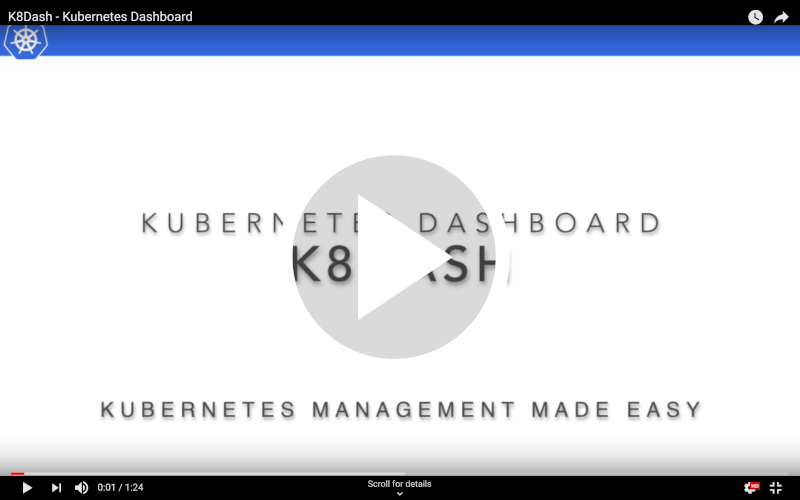 K8Dash is the easiest way to manage your Kubernetes cluster. Why? NOTE: never trust a file downloaded from the internet. Make sure to review the contents of kubernetes-k8dash.yaml before running the script below. There are multiple options logging into the dashboard. The first (and easiest) option is to create a dedicated service account. The can be accomplished using the following script. Retrieve the token value from the secret and enter it into the login screen to access the dashboard. K8dash makes using OpenId Connect for authentication easy. Assuming your cluster is configured to use OIDC, all you need to do is create a secret containing your credentials and run the kubernetes-k8dash-oidc.yaml config. NOTE: never trust a file downloaded from the internet. Make sure to review the contents of kubernetes-k8dash-oidc.yaml before running the script below. If you do not have an ingress server setup, you can utilize a NodePort service as configured in the kubernetes-k8dash-nodeport.yaml. This is ideal when creating a single node master, or if you want to get up and running as fast as possible. K8dash relies heavily on metrics-server to display real time cluster metrics. It is strongly recommended to have metrics-server installed to get the best experiance from k8dash. K8dash is made up of 2 parts. The server and the client. To run the server, run npm i from the /server directory to install dependencies and then npm start to run the server. The server is a simple express.js server that is primarily responsible for proxying requests to the Kubernetes api server. During development, the server will use whatever is configured in ~/.kube/config to connect the desired cluster. For the client, move to the /client directory, run npm i and then npm start. The client is a React application with minimal other dependencies.